This entry was posted on 30th November 2018 by WoodBlocX. 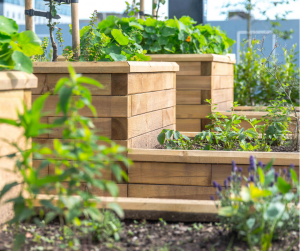 WoodBlocX timber raised beds, planters, ponds, walls and seats are not only loved by our customers for updating their gardens, patios and driveways, gardens, our strong and long-lasting structures can also be found in a number of other locations across the country. 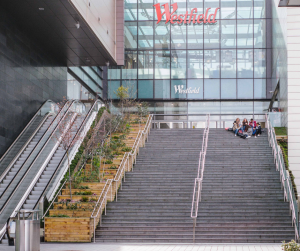 Our modular system can be seen in seen at one the UK’s busiest shopping centres; Westfield Stratford City, this huge retail hub attracts more than 50 million visitors a year and thousands on a daily basis. 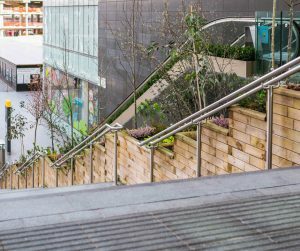 We installed a huge cascading planter at the entrance to the centre, nestled between an escalator and steps, the bespoke container is planted out with a mixture of trees and shrubs to bring a touch of nature to this urban shopping destination. You also find our raised beds around the outside of the centre providing visitors with areas to escape the hustle and bustle of the shops. 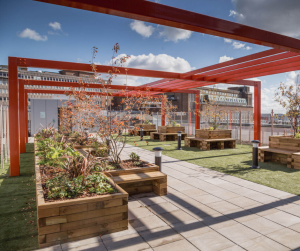 We have also worked on roof gardens for student accommodation complexes from London to Aberdeen, creating relaxing spaces for students to unwind in that are both practical and functional. 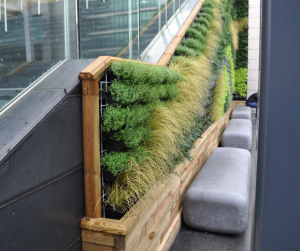 Using bespoke designs that work perfectly with the space, combining planters with integrated seating across large areas. 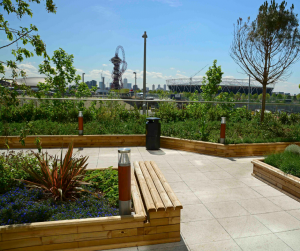 Our raised bed designs incorporate curves and zig zags to transform the spaces along wth clever planting and lighting. 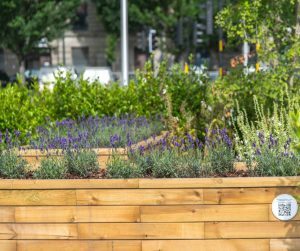 Dundee's new Waterfront development includes a number of WoodBlocX raised beds in it's Slessor Garden, which is a multi-functional space for the the public to enjoy and for hosting events. 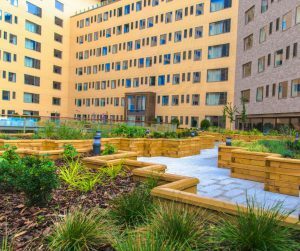 Our raised beds were used to create the sensory and heath gardens, with one set of raised beds including three different sections and multi-level planting to allow for different soil types to be used for growing a variety of plant species. 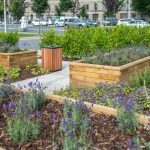 Our commercial work doesn’t stop there, we continue to partner with organisations across the country to provide raised beds for street planting and seating solutions for public spaces. 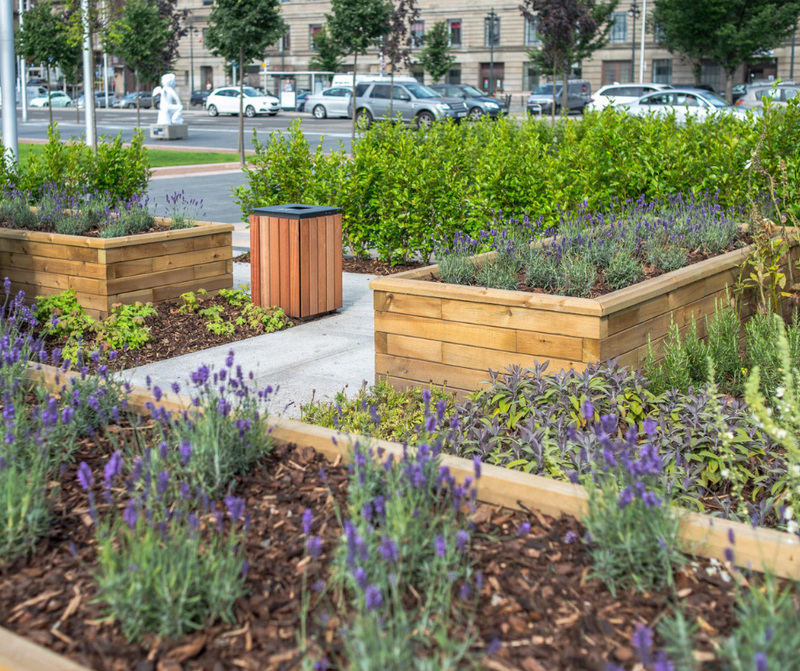 If these snap-shots have given you ideas for your own garden you can shop our range over on the website or if you have an idea and you’re not quite sure how to execute it, get in touch with our design team who will work with your ideas to create a bespoke design free of charge. Click below to find out more.